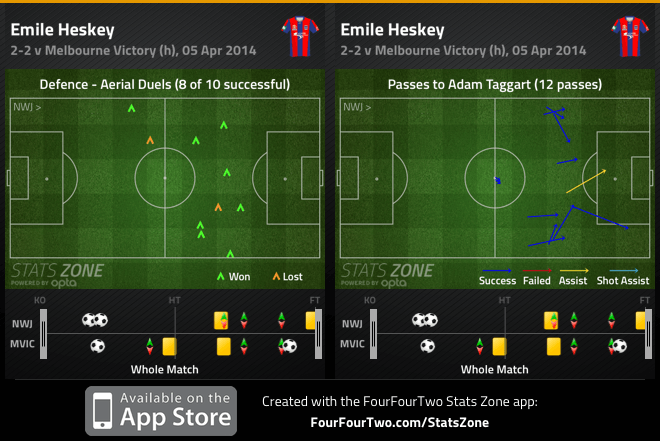 Melbourne Victory twice came from behind to steal a draw. Clayton Zane made one change from last week’s defeat to Perth Glory, as Zenon Caravella, who went off injured in that match, has been ruled out for the remainder of the season – Ben Kantarovski, who replaced him in that match, started here. With Asian Champions League commitments again midweek, Kevin Muscat made seven changes to his starting lineup, as Mark Milligan, Guilherme Finkler, Adama Traore and James Jeggo got the benefit of a full week off. Tom Rogic returned to the side after being omitted from the squad for last week’s clash with Sydney, while Nathan Coe returned in goals in place of Lawrence Thomas. Milligan’s penalty at the death looks to have ruined Newcastle’s bid for a finals place. Newcastle started brightly, with David Carney very quickly becoming the clear attacking outlet with his delivery from the left – he had the better of his direct opponent, Scott Galloway, throughout the first half, frequently beating him in 1v1s by crossing immediately after he’d created space with quick changes of direction. Zane has increasingly preferred a basic 4-4-2 in his short tenure, and encourages the side to play more direct – effectively bypassing the midfield zone when in possession and hitting the front two with long balls from the back. Interestingly, upfront, Emile Heskey was the deeper of the two strikers, often coming short between the lines to hold up play and inviting runners in behind. Although Taggart’s a good ‘link’ player, and when used as a number nine often drifts between the lines, here he seemed more comfortable moving in behind the defence with his pace. …winning the majority of his aerial duels and linking up nicely with his partner. Heskey’s movement to hold up play (Djite-esque) also created a few chances – he set up a Griffiths volley with a clever ball over the top that Coe could only parry behind. His physical presence, too, helped win knockdowns upfront, which helped Newcastle play their direct style. Joel Griffiths, on the right of the attacking quartet, moved narrow (unsurprisingly, given he’s normally a striker) from the right-wing, becoming an extra goal threat when Carney whipped in crosses from the left. Therefore, the Jets could attack these balls with three tall players, and the size mismatch seemed important throughout the match – along with the crosses in open play, they were also able to connect with a lot of corners, although the headers were mainly off-target. 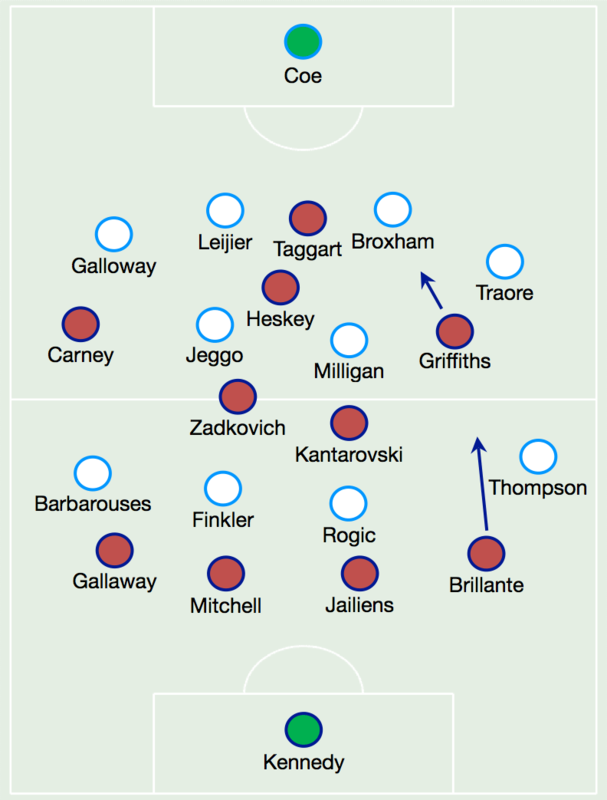 Right-back Josh Brillante benefitted from Griffiths’ narrowness – there was lots of space for him to overlap into, and he also looked dangerous cutting inside into the space between Milligan (the left-of-centre Victory midfielder) and Archie Thompson (the left-winger). Crucial to the Jets early momentum was how strong they pressed through midfield, with the two central midfielders – Ruben Zadkovich was particularly enthusiastic, and set the tone of the press with his spirited bursts from midfield – pushing high up onto Milligan and Jeggo, preventing the Victory pivot from getting time on the ball in deep positions. The energy of the front four was also important, as they closed down high up the pitch. The positioning of their ball recoveries and interceptions are telling. That caused Victory huge problems in terms of their attempts to play out from the back – so many of their passes were rushed, they were sloppy when on the counter-attack, and were forced into hitting longer balls towards the wide forwards. Invariably, the way the Jets midfield pushed up meant created space between the lines for Finkler and Rogic to move into (with the Jets centre-backs following them into these deeper positions, dragging the defensive line out of shape), but because of the effectiveness of the Jets pressing, the Victory playmakers weren’t actually able to receive the ball in these areas, and neither player had any real influence on the game. Three goals came in a remarkable three minute flurry midway through the half. Firstly, Newcastle took the lead through Heskey and Taggart combining excellently between the lines (with Brillante starting the move by darting through the centre) – it was a superb goal, and befitting of their early dominance. Incredibly, though, the Victory equalised minutes later with a goal completely against the run of play, with Milligan heading in from a corner. Barely seconds after that, though, the Jets had the lead once more – Carney’s delivery from the left rebounded off Taggart in the area, and Brillante struck the loose ball against the post, with the rebound going in off Adrian Leijier’s backside. It was an enormous strike of luck, but they deserved it on the balance of play – and Brillante’s contribution demonstrated his threat on the overlap. In fact, almost immediately after the goal, he got forward again to hit a stinging shot. Newcasle were superior in almost every facet of the game going into half-time, and deserved their lead. Muscat was forced into removing Rogic a few minutes before half-time, with James Troisi taking his place – although given how ineffectual the former was in the first half, he might have considered the change anyway. The Victory improved after the break, although Finkler alarmingly nearly played Taggart straight in on goal minutes into the half – he had to be thankful for Coe’s well-anticipated sliding challenge. As they have for most of the season, they had problems staying onside – in some games, like against Adelaide, this has been a direct consequence of an opposition’s high line, but Newcastle weren’t particularly high up the pitch here, and it was more of an issue of the attackers simply being poor with their positioning. Barbarouses was the main culprit here, but Archie Thompson has been guilty of it, too – as much as it as a consequence of their system, these are individual errors that shouldn’t be overlooked. Combined with improved passing through midfield, though, the Victory began to create more chances, getting into that space between Newcastle’s midfield and defence, with Troisi doing a good job darting in behind Zadkovich – he had a good shout for a penalty when Mitchell dived in at the top of the box, Troisi having latched onto a loose ball from Zadkovich. This would be something of a precursor to the late penalty. Zane’s first change was to bring on Nick Ward for Griffiths, which was basically fresh legs down the right, although he eventually moved centrally when Heskey was replaced by James Virgili. At the same time, Muscat made an attacking change – Andrew Nabbout for Jeggo, which meant Milligan was now on his own in front of the defence, with Finkler and Troisi ahead of him, and Thompson now central in a 4-3-3. Interestingly, Newcastle subtly changed the dynamic of their attacking quartet when Virgili came on – now Carney was coming narrow and had a few shooting chances on his right foot, while Virgili stayed wider and put in crosses from the right. They benefitted, too, from the fact the Victory now again were vulnerable playing out from the back, and struggled to control the ball after the change – it was too easy for Newcastle to get players in and out around Milligan in front of the defence, because of the defensive sacrifices Muscat had made to his system in trying to chase the game. He was simply too exposed in front of the defence. Again, the second Victory equaliser came against the run of play, and you could probably credit it partly to Muscat’s attacking switches – Finkler skipped past a challenge in deep midfield and hit a probing cross-field ball to Nabbout, who crossed low for Thompson in the middle where he was fouled. Previously, Finkler would have been higher up the pitch, and he benefitted from having three direct attackers running ahead of him off the ball as targets for the pass. The Victory were poor here and fortunate to get a point – and in reality, Muscat’s rolling of the dice at 2-1 down could’ve gone either way. Zane will be hugely disappointed with his side letting their lead slip after dominating so much of the first half. The balance of the front four was excellent, and Carney winning his individual battle with Galloway down the left was crucial, as was Brillante overlapping past Griffiths – both areas of strength lead directly to goals, and Newcaslte really should have been able to win this.